In 1767 the city was destroyed by the Burmese army, resulting in the collapse of the kingdom. The ruins of the old city now form the Ayutthaya historical park, which is recognized internationally as a UNESCO World Heritage Site. The city was refounded a few kilometers to the east. 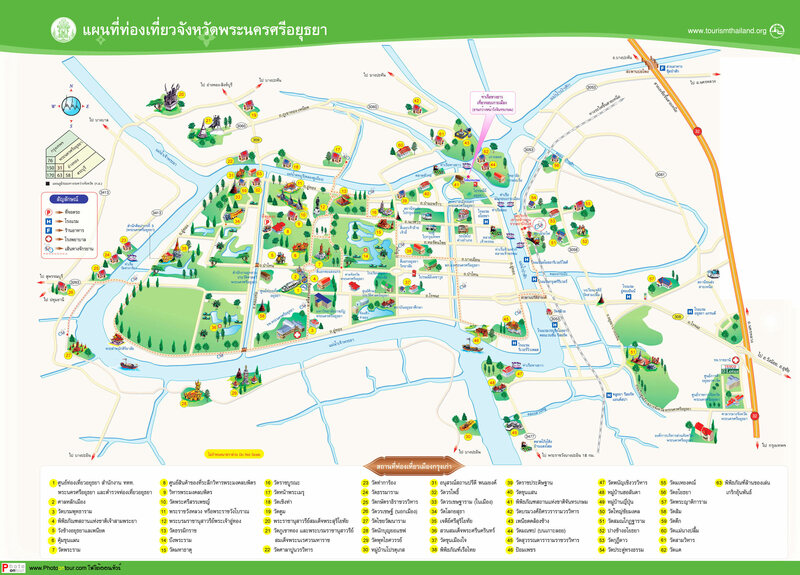 The city is sometimes called "Venice of the East"
The temple was constructed in 1630 by the king Prasat Thong as the first temple of his reign, as a memorial of his mother's resident in that area. The temple's name literally means the Temple of long reign and glorious era. It was designed in Khmer style which was popular in that time. It has a central 35 meter high prang in Khmer style (Thai: พระปรางด์ประธาน) with four smaller prangs. The whole construction stands on a rectangular platform. About halfway up there are hidden entrances, to which steep stairs lead. The central platform is surrounded by eight chedi-shaped chapels (Thai: เมรุทิศ เมรุราย - Meru Thit Meru Rai), which are connected by a rectangular cross-shaped passage (Phra Rabieng). The passage had numerous side entries and was originally roofed and open inwards, but today only the foundations of the pillars and the outside wall still stand. Along the wall, there were 120 sitting Buddha statues, probably painted in black and gold. The eight chedi-like chapels are formed in a unique way. They had paintings on the interior walls, the exterior ones decorated by 12 reliefs depicting scenes from the life of Buddha (Jataka), which must be "read" clockwise. Just fragments of the paintings and the reliefs survived. In each of the rectangular chedis were two sitting Buddha statues and in each of the four middle chedis was one big sitting Buddha statue, also lacquered in black and gold. The ceiling over those statues was of wood with golden stars on black lacquer. Outside of the passages on the east, close to the river was the temple's ordination hall (Phra Ubosot). North and south from the Ubusot stood two chedis with "12 indented corners" (Thai: เจดีย์ย่อมุมสิบสอง), in which the ashes of the king's mother were laid. After the total destruction of the old capital (Thai: กรุงเก่า - Krung Kao) by the Burmese in 1767, from which Wat Chai Watthanaram was not spared, the temple was deserted. Theft, sale of bricks from the ruins and the beheading of the Buddha statues were common. Only in 1987 did the Thai Department of Fine Arts start restoring the site. In 1992 it was opened to the public.
" กองทัพพม่าได้เข้าล้อมกรุงศรีอยุธยาไว้ แล้วระดมยิงปืนใหญ่เข้าในพระนครทุกวัน จนราษฎรได้รับความเดือดร้อนและเสียขวัญ สมเด็จพระมหาจักรพรรดิ ต้องเสด็จไปเจรจากับพระเจ้าบุเรงนอง ที่พลับพลาบริเวณตำบลวัดหน้าพระเมรุ กับวัดหัสดาวาส ยอมเป็นไมตรี โดยได้มอบช้างเผือก 4 เชือก พร้อมกับพระราเมศวร พระยาจักรี และพระสุนทรสงครามให้แก่พม่า โดยสมเด็จพระมหาจักรพรรดิทรงต่อรองของดินแดนของอยุธยาทั้งหมดที่พระเจ้าบุเรงนองยึดไว้คืน พระเจ้าบุเรงนองก็ถวายคืนแต่โดยดี จากนั้นพม่าก็ถอยกลับไปหงสาวดี "